I got to know 'Child in time' as the number 1 of the Top 100 of all times, which was played annually on Radio Veronica. It was an extremely interesting track to me, mainly because of the tension and build-up in the first half of the song and the extreme noise at the end. 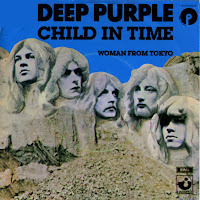 Deep Purple wrote and recorded 'Child in time' in 1969 for their album 'In rock' (1970). The original album version is 10 minutes and 18 seconds long. For this single release, the track was slightly edited. Vocalist Ian Gillan utilizes his entire vocal range for this song, starting out low and almost whispering, to high-pitched screaming at the end of the song. Since 1993, when Gillan returned to Deep Purple, the band has not played this song live anymore. They only played it once in 2002, and on this occasion high-pitched guitar covered up Gillan's now-limited vocal range. 'Child in time' charted twice in the Netherlands: in 1972 it peaked at number 10 during its 12 week chart run, and in 1975, it reached number 9 during a 10 week chart run. My copy of the single is a re-release from the mid-Eighties.